The Earl of Blaize is the black sheep of his family. A semi-recluse, he has a terrible temper that earned him the nickname “Lord Lion.” Lionel suspects his father’s involvement in Cousin Percival’s unexpected and unwanted bequest of a precious book collection. After all, his father’s favorite pastime is underlining Blaize’s failings. When Diana arrives instead of his trusted school-friend, the Earl nearly sends her away. Only Archie’s uncanny talent with animals and atypical intelligence inspire Blaize to retain her. Then, Diana discovers Blaize’s carefully-guarded secret. As she tries to help him, they become close. They might even be falling in love . . . an awkward situation when evidence surfaces that Dracot may not be dead after all! Rebecca Ward’s characters are unremarkable and thinly-drawn. For example, “Lord Lion” is famed for his temper, but he rarely shows it on the page. When he does, he seems no more cranky than your average Regency hero. Diana is a plucky, independent, as-educated-as-a-man heroine. Their chemistry is just fine, especially in the central portion of the book. Unfortunately, “just fine” chemistry is not good enough. For me, the highlight of Ward’s book is Archie. The author’s treatment of the pre-teen’s atypical intelligence (as well as other facets of the book that I won’t give away) is not common in Regency romances. Often, these books treat the era as if the various challengs we face today did not exist in the past. The books that do deal with such issues (be it near-sightedness in Birds of a Feather, obesity in The Wicked Cousin, or blindness in One Unashamed Night) stand out in my memory. 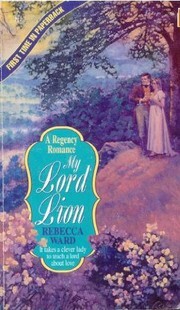 Unfortunately, Archie is not enough to make My Lord Lion a good book. Although the middle is strong, Ward indulges in an improbable detour in the last third. Annoying characters, improbable travels, and contrived impediments to Lionel and Diana’s relationship ruin what was a sweet story. My Lord Lion is absorbing enough as you read it, but it quickly fades from your memory. I can’t recommend it.